The 5 time award winning dance music show, We Are FSTVL has grown year upon year, proving itself as one of the biggest players on the dance festival circuit since its inception in 2013. With the dawn of 2019 heralding We Are FSTVL’s seventh edition, the UK’s most celebrated dance festival (Best Dance Event at 2016’s UK Festival Awards) continues to grow, combining innovative stage designs and mind-blowing production with a varied mix of genres from across the dance music spectrum. 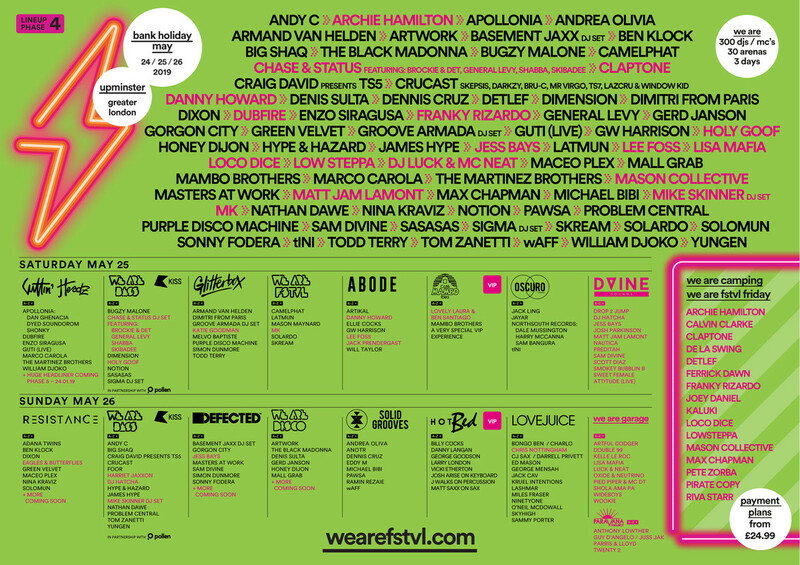 Bringing together the world’s biggest names in dance music, underground and grime, alongside some of the world’s leading dance music brands and labels, We are FSTVL 2019 will play host to over 300 acts across 30 arenas between 24th-26th May, with an all-star billing announced as part of the phase one line-up announcement. Not content with hosting an expansive world class line-up, We Are FSTVL places a huge emphasis on production to create an unrivalled festival experience. Taking place over a sprawling 142 acre former WW1 airfield in Upminster, Greater London, custom built structures give each arena its own distinctive identity to create a series of parallel worlds. From the ground breaking 450ft long Terminal 1 arena through to the mighty LED walls of The Aerodome, We Are FSTVL 2019 will be expanding on its airport heritage with its brand new “Neon Jetset Overload” theme.